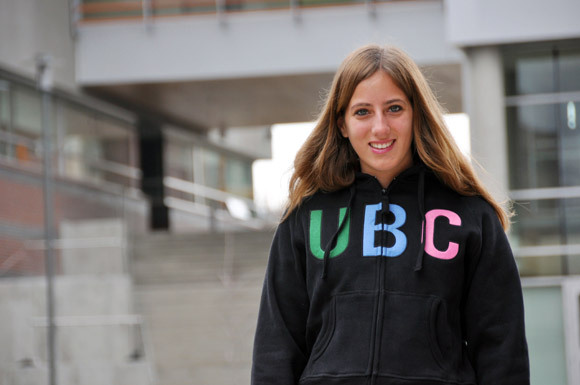 Sabrina Tikhomiroff, a second-year Bachelor of Management student from Brazil, says she loves her on-campus job as a mentor to first-year students at UBC's Okanagan campus. Almost 550 UBC students are working on campus this academic year through the Work Study and Work Learn programs, which provide a payroll subsidy of more than $780,000 in student wages. Operated by the Career Centre, the Work Study program is designed to create employment opportunities on campus for domestic undergraduate and graduate students, while Work Learn caters to international undergraduate students. "The programs enable students to stay on campus and avoid a commute; it really bonds them to the campus community and allows them to contribute to their faculty or department in a very meaningful way," says Deanna Simmons, On-Campus Student Employment Program Coordinator. "Plus, students can develop career-related experience and can gain an advantage in their transition from school to the work force." Student jobs on campus come in all varieties, ranging from ambassador roles and tutoring opportunities to collegium monitors, event coordinators, research assistants, project assistants and website designers. Depending on their area of interest, students work with a number of different departments or faculties, including Athletics, Campus Life, Learning Services, Career Centre, and faculties such as the Irving K. Barber School of Arts and Sciences, Faculty of Creative and Critical Studies, and School of Engineering. "In addition, I would estimate there are about 350 students on campus who are employed outside of the Work Study and Work Learn program," adds Simmons. "This would include our graduate and undergraduate research assistants, teaching assistants, peer advisors and academic assistants." Sabrina Tikhomiroff, a second-year Bachelor of Management student in the Work Learn program, says her work experience as a peer mentor was life changing. "I have met so many people from different places who taught me so many things," she says. "The diversity certainly made me grow as a person. I improved my leadership, critical thinking, time management and communications skills and learned how to act professionally in a work environment." "UBC is creating employment opportunities for our students, who are then able to invest back into their university, their future, and the Okanagan economy," says Simmons. For more information on the Work Study or Work Learn program, visit www.ubc.ca/okanagan/students/careers/services/jobs/workstudy.html.